Potentiam Youth Development Center has embraced extracurricular activities as a means of helping young people to remain active and motivated. 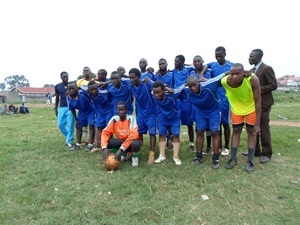 The Center has enabled the youth to participate in both football and volley ball. However, the dominant game is football where they have gone ahead to try and form a team. The football team of the Youth Centre has grown tremendously and is catching up with the required standards for an organized football team. During the year, the team participated in the Elijah cup tournament competition that attracted all Makindye Division football teams. The team is evidently building up in strength and is hopeful of winning one of the tournaments next year. In addition to the football team, the Centre also has a Volley ball team. Thanks to the community that once again donated land for the Volley ball pitch. Although the volley ball team has not constituted itself well enough to face any major competition, they are optimistic of joining at least one of the local tournaments next year.